08.07.2013*/Kazakhstan/ Karagandy Province/ Rostovka - A PZL-104 Wilga plane crashed on takeoff injuring the 4 occupants. */US/ KS/ Hays Regional Airport (KHYS) - A Maule M-7-235B Super Rocket plane (N235TT) collapsed the left main gear on landing. */US/ KY/ Pulaski County/ Bronston/ near Boss Airport (08KY) - A small plane crashed shortly after takeoff injuring the 2 occupants. */Netherlands/ Rotterdam/ The Hague Airport (RTM/EHRD) - Robin DR.400/140B airplane (PH-SPZ) caught fire on landing. One of the wings.was damaged. 09.07.2013*/New Zealand/ Ohaupo - A Diamond DA20-C1 Katana plane (ZK-CSD) made an emergency landing due to engine problems. The pilot received minor injuries. 10.07.2013*/US/ ID/ Kamiah Municipal Airport (S73) - A training Cessna 152 plane (N46566) crashed on takeoff. The sole student pilot received minor injuries. */US/ ID/ Blackfoot - A Stinson 108-3 Voyager plane (N703C) experienced apparent fuel exhaustion and flipped over during the force landing. */US/ NV/ Fallon Municipal Airport (KFLX) - A Beech A36 Bonanza plane (N517DJ) force landed to desert terrain. The four occupants were slightly injured. */Ukraine/ Chernivets'ka oblast/ Luzhany - An ultralight aircraft crashed killing the 2 occupants. 11.07.2013*/US/ OR/ Canby/ Dietz Airpark (OR40) - A Boeing A75N1 Stearman plane (N62465) crashed on landing. No injuries. */Pakistan/ Punjab/ Mianwali district/ near Isakhel town - PAF Chengdu F-7P jet crashed during a training mission. The pilot was slightly injured. */Ukraine/ Kherson Oblast/ Velikaya Kardashynka - A Mi-2 helicopter (UR-15604) overturned on its side and caught fire in high wind conditions. 15.07.2013*/Guyana/ near Matthews Ridge Airport (MWJ) - Air Services Cessna 208B Grand Caravan plane (8R-AMS) crashed on approach injuring the 13 occupants. */Kazakhstan/ Kyzylorda Region/ Shieli District - Astana Flown Spur Antonov 2 agricultural plane (UP-A0126) crashed during fertilization of a rice field. Both pilots were injured. 16.07.2013*/US/ MN/ SE of Beauford - A Piper PA-22 Tri-Pacer plane (N663A) experienced a loss of power and force landed to cornfield, but flipped over. No injuries. */Argentina/ near Veronica-Punta Indio Airport (SAAI) - A training Cessna 172N Skyhawk plane (LV-BPP) crashed killing the 2 occupants. */Romania/ Suceava/ Salcea Airport - A training Coavio DF2000 Top plane (YR-5141) collapsed the nose gear on landing. No injuries. */Canada/ SK/ Carlyle/ Carlyle Airport (CJQ3) - A training Cessna 172 Skyhawk plane experienced a loss of directional control and departed the runway, coming to rest inverted. No injuries. */Brazil/ AM/ Manaus-Eduardo Gomes International Airport (MAO/SBEG) - Apui Taxi Aereo Beechcraft 58 Baron plane (PR-OKK) crashed and burned on takeoff. On board were the pilot and 5 passengers. Three of them died and 3 were seriously injured. */US/ MN/ Duluth/ Superior Bay/ near Sky Harbor Airport (KDYT) - A Benoit Type XIV replica biplane was substantially damaged during a water landing. 17.07.2013*/US/ TN/ Collierville - Two people were injured when a Merlin GT small plane (N618V) crash-landed in a lake in Memphis suburb of Collierville. */US/ MI/ West of Gaylord - An agricultural Grumman G-164A Ag-Cat plane (N8719H) crashed in a wooded area injuring seriously the pilot. */US/ OH/ Sugarcreek - A training Christen Pitts S-2B plane (N519ZB) lost an engine power and made an emergency landing. No injuries. */US/ CO/ Denver/ Rocky Mountain Metropolitan Airport (KBJC) - A Cessna 162 Skycatcher plane (N60575) experienced a loss of directional control and departed the runway after landing. The two occupants onboard received minor injuries. */US/ FL/ Fowler/ Sylvia Lake - An experimental Kolb Mark III float aircraft (N175TS) impacted the water shortly after takeoff injuring the pilot. */Czech Republic/ Jicin/ Zlunice - An agricultural Let Z-37A Cmelak plane (OK-HJF) crashed injuring seriously the pilot. */US/ SC/ Woodruff/ Triple Tree Airport (SC00) - A Boeing A75N1 Stearman plane (N5815V) clipped a tree on landing and crashed injuring slightly the two occupants onboard. 18.07.2013*/Finland/ Ylojarvi/ north of Iso Otava island/ Nasijarvi lake - A light float plane flipped over on landing. The pilot received minor injuries. */Germany/ Rhineland-Palatinate/ Fohren/ near Trier-Fonren Airport (EDRT) - A Murphy Renegade Spirit aircraft ((LX-WGM) crashed during an emergency attempt to return to the airport. The sole pilot onboard received serious injuries. */Italy/ Verona Boscomantico - A Grob G103 Twin Astir glider (I-IAVS) after landing run into Cessna F172 (I-ACMQ) and damaged it. The student pilot on board of the glider was injured. 19.07.2013*/Brazil/ MS/ Sierra de Bodoquena - A Beech G36 Bonanza plane (PR-KEX) crashed on farmland killing the 2 occupants. */Brazil/ MS/ Tangara DA Serra (TGO) - A small plane crashed on takeoff due to a gust of wind. No injuries. */Panama/ Panama City/ Isla Perico - My Flight Corp Britten-Norman BN-2A-21 Islander plane (HP-1338MF) made a forced landing due to an engine failure. */Argentina/ 12 km from Saenz Pena - A Piper PA-11 Cub Special plane (LV-NJW) was shot by gun fire from the ground and made an emergency landing in a field. The pilot was seriously injured. */US/ TX/ Wichita Falls/ near Sheppard Air Force Base (KSPS) - An USAF Northrop T-38C Talon training plane (61-0891) struck a bird inflight and crashed. The 2 pilots ejected, but received minor injuries. 20.07.2013*/Sweden/ Orsa/Tallhed Airport - A para glider crashed on takeoff injuring a man and a woman. */Brazil/ MG/ Teofilo Otoni - An Aero Bravo 700 plane (PU-GUE) made an emergency landing on a soccer field, but crashed.killing the pilot. */China/ Zhangye - A powered glider hit a tower and crashed killing the passenger, injuring the pilot. */US/ MS/ near Tupelo Regional Airport (KTUP) - A Beech A36 Bonanza plane (N117HB) crashed on landing. The pilot received minor injuries. 21.07.2013*/Russia/ Krasnodar Krai/ Solohaul - An IAR 316B (SA 316B Alouette III) helicopter (RA-1881G) madde a hard landing. No injuries. */Russia/ Murmansk region/ Lovozersk/ Rynda River - An Eurocopter EC-120B Colibri helicopter (RA-04049) rolled over on takeoff, when the passengers had gotten off the helicopter killing 2 Britons and their Russian guide. The pilot was injured. */Ukraine/ Krasnoperekopsky region/ Pyatikhatki - An agricultural Antonov 2 plane (UR-ART) made an emergency landing and flipped over. No injuries. */UK/ Kent/ English Channel off Dungeness - A Cirrus SR22/GTS plane (N147KA) crashed into the English Channel. The pilot is missing. */US/ IN/ LaPorte County - A Quad City Challenger II ultralight aircraft crashed in a cornfield killing the pilot. */Iceland/ Reykjavik-Keflavik International Airport (KEF) - Sukhoi Civil Aircraft Sukhoi Superjet 100-95 plane (97005) performed a test flight without one engine working. Due to a gust of wind the jet touch the runway and made a belly landing. An expert received a leg trauma during the evacuation. */Georgia/ Telavi - A helicopter crashed in the center of the town injuring the 2 occupants. */Japan/ Tajima Airport (RJBT/TJH) - A Gulfstream Aerospace AG-5B plane (JA4175) overrun the runway on landing injuring the 3 occupants. */US/ AK/ near King Salmon/ Naknek River - Katmai Air Cessna T207A/ Soloy Turbine 207 plane (N499K) struck a fishing boat on the takeoff and came to rest inverted and submerged. Two of the seven occupants onboard received minor injuries. One of the three occupants onboard the fishing boat also received minor injuries. 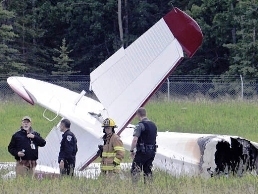 22.07.2013*/US/ VA/ Spotsylvania County/ Fredericksburg/ near Shannon Airport (KEZF) - A Cessna 172M Skyhawk plane (N61954) crashed killing the pilot. */US/ CA/ South Lake Tahoe/ near Lake Tahoe Airport (KTVL) - A Mooney M20C Ranger plane (N6709U) crashed shortly after takeoff killing a man, injuring his wife. */US/ NY/ New York-La Guardia Airport (LGA) - Southwest Airlines Boeing 737-7H4 (WL) jet (N753SW) with 150 occupants on board collapsed the landing gear on landing and skidded down the runway on its nose. Ten people received minor injuries. 24.07.2013*/India/ Kedarnath/ Garud Chatti - Trans Bharat Aviation Bell-407 helicopter (VT-TBE) crashed in bad weather killing the 2 occupants. */US/ AK/ Prince of Wales island/ near Lake Galea - Promech Air de Havilland Canada DHC-2 Beaver Mk1 plane ((N4787C) lost an engine power, struck trees and crashed injuring the 4 occupants. 25.07.2013*/US/ IN/ Columbus/ near Columbus Municipal Airport (KBAK) - A Glasair GlaStar GS-1 plane (N513GC) crashed into a house shortly after takeoff injuring seriously the 2 occupants on board. On 03-th August the pilot (81) died due to his burns and injuries. */US/ HI/ Hilo/ near Hilo International Airport (PHTO) - A McDonnell Douglas MD 500 (369E) helicopter (N500PH) performed an autorotation to a field and came to rest on its side, sustaining substantial damage. No injuries. */Italy/ Torino Aeritalia - A Sportline Aviacija LAK-17A Nida glider (D-6545) crash-landed. */Italy/ between Ascoli and Castelluccio - A Piper PA-28R-200 Cherokee Arrow plane (I-TILE) made an emergency landing on a road. */US/ ID/ Pocatello/ Pocatello Regional Airport (KPIH) - A Cessna A185F Skywagon plane (N31YH) collapsed the left landing gear on landing. */Canada/ ON/ East of Minto - A Beech C35 Bonanza plane (C-GMKK) force landed to a road. The 2 occupants received minor injuries. */UK/ Co. Down/ Newtownards/ Dairy Hall Playing Fields - A Tecnam P.2002 Sierra airplane (G-UFCM) carried out a forced landing in a field. The 2 occupants received minor injuries. */Sweden/ Oland/ Borglanda airport (ESMB) - A Cessna F172M plane (SE-GMA) crashed on takeoff. */Denmark/ Bronderslev i Nordjylland - An Evektor EV-97R Eurostar airplane (OY-9354) crashed on takeoff due to an engine failure. The 2 occupants were injured. 26.07.2013*/Venezuela/ near Maracaibo AB - A military Hongdu K-8W Karakorum trainer jet (2702) crashed. The pilot ejected, but received injuries. */US/ Belmar/ Farmingdale/ near Monmouth Executive Airport (KBLM) - A Cessna 172M Skyhawk plane (N61928) crashed injuring slightly the pilot. */US/ OK/ Pottawatomie County/ west of Tecumseh - Oklahoma Highway Patrol Cessna 182S Skylane plane crashed injuring seriously the pilot. */Canada/ BC/ Hamber Provincial Park/ Fortress Lake - A Cessna-182 float plane (C-GLCY) crashed killing the pilot. 27.07.2013*/US/ MT/ near Thompson Falls - A Robinson R44 Raven II helicopter (N25WH) crashed killing 1, injuring the remain 2 occupants on board. */Russia/ near Ukhta - A Let L-200D Morava plane ((RA-0364G) crashed and caught fire. */Russia/ Orenburg Oblast/ Tashlinsk region - An agricultural Rotor R-16 Ural motor deltaplane crashed killing the 2 occupants. */Turkey/ Ankara Esenboga - A training Piper PA-34-220T Seneca III airplane (TC-IDA) made a belly landing. */Sweden/ Vastra Gotaland/ Pjungserud - An Avid Amphibian aircraft crashed in a wooded area killing the pilot. */US/ WA/ Quilcene/ near Kimshan Ranch Airport (WN00) - A Piper PA-18-135 Super Cub plane (N37JR) experienced fuel exhaustion and force landed to a field coming to rest inverted. The pilot was seriously injured. 28.07.2013*/Russia/ Yemelyanovsk district/ Krasnoyarsk territory - A homebuilt airplane crashed shortly after takeoff killing the pilot. */Russia/ near Shakhty Airport - An Antonov 2 plane (FLA-3618K) lost an engine power shortly after takeoff and made a hard landing. No injuries. */US/ NY/ Shirley/ Brookhaven Calabro Airport (KHWV) - A Cessna 210M Centurion plane (N450EM) overturned on takeoff injuring slightly the 4 occupants. */US/ IN/ Tippecanoe County/ Romney/ near Timber House Airport - A single-engine Piper Cherokee had crashed shortly after takeoff. The 4 occupants received minor injuries. */Finland/ Kanta-Hme/ Loppi/ near Rayskala airfield (EFRY) - A glider landed on Iso-Melkutin Lake near end of the runway. No injuries. */US/ WA/ Tacoma Narrows Airport (KTIW) - A Cessna 162 Skycatcher plane (N1205J) collapsed the nose gear on landing. No injuries. */US/ CA/ near Lone Pine Airport (O26) - A Beech 35-B33 Bonanza plane (N82282) was destroyed by a post-impact fire following a force landing to a field. The 4 occupants onboard received minor injuries. 29.07.2013*/Romania/ Mures County/ Taureni Lake - An Eurocopter EC 130 (AS 350 B4) helicopter (YR-BTM) crashed shortly after takeoff killing 5, injuring seriously 1. */US/ IN/ Knox/ near Starke County Airport (KOXI) - A Vans RV-6A plane (N914ES) crashed on approach killing the pilot. */US/ KY/ Breathitt County/ near the Magoffin County Line - Kentucky (DEA) State Police helicopter crashed and caught fire injuring the 2 occupants. */Venezuela/ Valencia (SVVA) - A Beechcraft F90 King Air plane (YV503T) collapsed the left hand main gear on landing. */China/ Guangzhou Nansha/ Dagang Town - A training helicopter crashed killing the insructor and a female student. */US/ CO/ NE of Monte Vista - An agricultural Grumman G-164A Ag Cat plane (N5324) force landed to a field and flipped over. No injuries. */US/ MD/ east of Leonardtown/ Brewer Farm - A Mooney M20J 201 airplane (N4570H) force-landed to a cornfield and was damaged. No injuries. */Canada/ QC/ Val d'Or - An ultralight aircraft crashed in a wooded area killing the pilot. */US/ WV/ Wetzel County/ Smithfield - An agricultural Hughes 369D helicopter (N31HM) crashed in a wooded area. The sole pilot onboard received minor injuries. 30.07.2013*/UK/ Hertfordshire/ Welwyn Garden City/ (EGLG) - A Beech 58 Baron plane (N6751W) overran runway and came to rest on its belly, damaged. No injuries. */Tanzania/ Arusha/ Longido district/ Merugwayi village - A Cessna 404 Titan airplane (5Y-DOC) crashed shortly after takeoff due to a strong gust of wind. The 7 occupants on board were injured. 31.07.2013*/Ethiopia/ Oromia State/ East Shoa Zone/ Debre Zeit - UNDP Sudan Mi-17 helicopter (RA-25497) made an emergency landing and crashed injuring 4 occupants of 6 on board. */US/ KS/ Barton County/ Ellinwood Airport - A Luscombe 8A small airplane crashed on takeoff. No injuries. An air taxi crashed Sunday at a small Alaska airport, killing all 10 people (9 passengers and 1 pilot) on board and leaving the aircraft fully engulfed in flames before firefighters could get to it. The de Havilland Canada DHC-3T Texas Turbine Otter air taxi (N93PC) crashed just after 11 a.m. at the airport in Soldotna, a community about 75 miles SW of Anchorage and located on the Kenai Peninsula. The Otter was operated by Rediske Air, based out of another Kenai Peninsula community, Nikiski. The aircraft was flown by Nikiski pilot and company owner Willy Rediske with nine passengers onboard. The remains of all 10 people have been recovered and sent to the State Medical Examiner's Office in Anchorage for autopsies and positive identifications. Weather at the time of the crash was reported to be cloudy with a light wind. The crash was under investigation. Boeing 777-28EER с регистрационен номер HL7742 на южнокорейската авиокомпания Asiana Airlines, полет 214 с над 300 души на борда катастрофира при опит за кацане на международното летище в Сан Франциско, САЩ. Загинали са две 16-годищни момичета от Китай отиващи на летен лагер в САЩ. Наранявания са получили 182 души от тези на борда, като 49 от тях са в тежко състояние. Един от пилотите участващ в приземяването на самолета бил обучаем. Две секунди преди удара с кея екипажът се опитал да преустанови приземяването, което при намалената скорост, вероятно допълнително е влошило профила на кацане и трагедията станала неизбежна. Самолет Boeing 777-BEER (HL7742), рейс 214 летевший из Сеула, разбился в субботу при посадке в международном аэропорту Сан-Франциско. На борту находились 307 человек — 291 пассажир и 16 членов экипажа. Из них 141 гражданин КНР, 77 граждан Южной Кореи, 61 американец и один японец. По последним данным, погибли два человека, 182 госпитализированы, 49 из них находятся в критическом состоянии. По данным Asiana Airlines,чей самолет потерпел катастрофу в Сан-Франциско, жертвами катастрофы стали Юй Менгянь (Ye Mengyuan) и Ван Линьцзя (Wang Linjia). Девушки учились в средней школе провинции Чжэцзян на востоке КНР. Как в свою очередь сообщили представители министерства образования КНР, всего на борту самолета находились порядка 70 студентов и учителей из Китая, которые летели в США на отдых в летние лагеря. 12.07.2013 - Число жертв крушения южнокорейского лайнера Boeing 777 в Сан-Франциско выросло до трех. Tретьей жертвой также стала несовершеннолетняя гражданка Китая, Лиу Ипенг. В пятницу она скончалась в больнице в Сан-Франциско. An Asiana Airlines flight 214 packed with more than 300 people slammed onto the runway while landing at San Francisco airport Saturday and caught fire, forcing many to escape by sliding down the emergency inflatable slides and into a trail of metal debris as flames tore through the plane. Two people who were found outside the wreckage died in the crash, while another 182 people were taken to hospitals, many with minor injuries, authorities said. Forty-nine people were reported to be in critical condition. 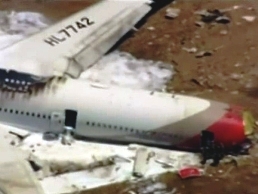 The two Chinese victims of the Asiana Flight 214 crash in San Francisco were identified Sunday as teenage schoolgirls in eastern China, headed to the USA for a two-week summer camp. Ye Mengyuan and Wang Linjia, both 16, were students at Jiangshan Middle School in Zhejiang province bordering Shanghai, reported China Central Television. As the Boeing 777-28EER jet (HL7742) approached the runway from the waters of San Francisco Bay around noon, travellers in the terminals and others eyewitnesses could see that the aircraft was swaying unusually from side to side and that at one point the tail seemed to hit the ground before breaking off. 12.07.2013 - A Chinese girl Liu Yipeng died in hospital on Friday, becoming the third fatality in the crash of an Asiana Airlines jet at SFO. Вертолет Ми-8Т на „Полярни авиолинии” с регистрационен номер RA-22657 е изпълнявал полет от Депутатски към Казаче, Република Саха (Якутия), в сложни метеорологични условия, когато се ударил във възвишение и в резултат на катастрофата напълно изгорял. От 28-те души на борда, 24 са загинали, а четирима (тримата членове на екипажа и 17 –годишен младеж) са оцелели с разлчни по тежест наранявания. Вертолет Ми-8T (RA-22657), рухнувший во вторник в труднодоступном районе Якутии полностью сгорел, сообщил журналистам начальник управления информации МЧС РФ Олег Воронов. Ми-8, принадлежавший "Полярные авиалинии", выполнял рейс из якутского поселка Депутатский в село Казачье. Экипаж совершил жесткую посадку во вторник. На борту находились 28 человек, в том числе 11 детей. Погибли 24, выжили четверо: три члена экипажа и 17-летний пассажир Эрэл Горохов. Пострадавшие эвакуированы и доставлены в больниц. "Вертолет удалось обнаружить благодаря сигнальной ракете, выпущенной экипажем. Он найден полностью сгоревшим", - сказал Воронов. An MI-8T helicopter (RA-22657), owned by Polyarnye Avialinii, crashed in Russia's Yakutia region in eastern Siberia on Tuesday killing 24. There were three crew members and 25 passengers on board. Four of them, the 3 crew-members and a 17-year-old young man were injured, but survived the crash. Of the 25 passengers 11 were children, the emergencies ministry said in a separate statement. The people died when the helicopter performed a hard landing, apparently in bad weather conditions, 66 kilometres northwest of the small town of Deputatsky in the Yakutia region in Russia's north. A helicopters with rescuers and medics on board has arrived at the crash site. 01.07.2013*/Canada/ AB/ Okotoks Air Ranch Airport (CFX2) - A Piper PA-32RT-300T Turbo Lance II plane (C-GJDC) force landed shortly after takeoff, damaged. */Germany/ Klippeneck Airfield - A Glaser-Dirks DG-600/18M glider (D-KMDG) crashed shortly after takeoff killing the pilot. */Switzerland/ Uri/ near Krontenhutte - An Eurocopter AS 350B3 Ecureuil helicopter (HB-ZMO) crashed on a hillside killing the 4 occupants. 02.07.2013*/US/ TX/ Bridgeport Municipal Airport (KXBP) - A Beechcraft P35 Bonanza plane (N8585M) crash landed into a pasture injuring slightly the 2 occupants. */US/ MT/ Fort Smith/ Crow Indian Reservation - An Aviat A-1B Husky plane (N302MX) crashed injuring 1 of the two occupants on board. */Bangladesh/ Bardail area/ Dhamrai area - A military Bell 206L-4 LongRanger IV helicopter (S3-BMK) crash-landed injuring 2 military officials. */Czech Republic/ Krelovice/ Jiricky - A Fantasy Air Cora Legato aircraft (OK-CUE 35) made a hard landing in a field. One occupant was injured. */Germany/ Oerlinghausen-Wahrentrup - A Schleicher ASK 21 glider (D-4955) struck power lines on approach and made a force landing injuring slightly 2. 03.07.2013*/US/ UT/ Hurricane - A retired U.S. Air Force major is in a hospital after his small plane crashed near the Hurricane Municipal Airport. */US/ AZ/ Phoenix-Mesa Gateway Airport (KIWA) - A Cessna T210K Turbo Centurion (N272EF) collapsed the left main gear during an emergency landing. */Slovakia/ Ostratice - A VSO-10 glider crashed during a competition flight injuring the pilot. */Canada/ NL/ Moosehead Lake - A government Canadair CL-215-6B11 (CL-415) firefighting plane (C-FIZU) sunk, while it was scooping water. 04.07.2013*/US/ PA/ Easton/ near Braden Airpark (N43) - A Beechcraft A23-19 Musketeer Sport plane (N4785J) experienced a runway overrun and subsequent nose-gear collapse upon landing. No injuries. */Brazil/ GO/ Corumba de Goias/ 108 km de Goiania - A Robinson R44 Raven II helicopter (PR-DCM) crashed into trees injuring slightly the 4 occupants. 05.07.2013*/Brazil/ PR/ Curitiba/ Jockey Club of Parana - A training Cessna-152 plane (PT-FLF) crashed on landing injuring slightly the 2 occupants. */Colombia/ off Puerto Bolivar - Two Cirrus SR22 aircrafts, N610BG and HK-4752 suffered a mid-air collision while flying in formation near Puerto Bolivar, Colombia. HK-4752 made an emergency landing at Puerto Bolivar Airport (SKPB), N610GB crashed into the sea after activation of the CAPS (Cirrus Airframe Parachute System) No casualties. 06.07.2013*/France/ between Le Bugue and Rouffignac/ Fleurac - A Guimbal G2 helicopter (F-HBEA) made an emergency landing and landed on its side injuring 2. */Russia/ Leningrad Oblast/ Korkino - A training Yakovlev Yak-52 plane collapsed the nose gear on landing, skidded and caught fire. No injuries. */Switzerland/ Reiden - A training Robinson R22 Beta II helicopter (HB-ZDI) crashed on its left side. The occupant received a head injury. */Germany/ near Grabenstetten (EDSG) - A Schempp-Hirth Discus 2b glider crash-landed. The pilot onboard suffered minor injuries. */US/ AK/ Kodiak/ Monashka Bay - An Aeronca 11AC Chief plane (N9118E) experienced a loss of power and ditched in Monashka Bay. The aircraft sank inverted and the pilot onboard received minor injuries. */US/ MI/ Chesaning/ Chesaning Middle School - An experimental ultralight aircraft crashed killing the pilot. 07.07.2013*/Israel/ Gaza Coast - F-16I Block 52+ jet crashed into the sea off Gaza Coast. Both pilots ejected and were rescued by a helicopter. */Syria/ Al-Khalkha Military Airport - A Syrian Air Force airplane shot down by rebels. */US/ CA/ Groveland/ Pine Mountain Lake Airport (E45) - An experimental twin-engine aircraft N94C) crashed on landing injuring the 2 occupants.